92% of people use search engines to find services and products. 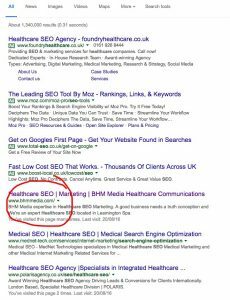 Getting your website on the first page of Google for your speciality can be a game changer to your practice but getting there requires a lot of hard work. There are more than 25 metrics that Google measure to rank your site, but most of these fit into an established set of principles and if your site is built to a good standard there is no reason why you can’t get there. Google Friendly Site, configured and optimised to be found. So whilst the process is straight forward, the problem is that this isn’t a ten minute job. Working with search engines requires dedication and the implementation of a process which is very hard to do on top of actually running your business. If you want to be on the first page of Google then you need a pro and that’s where we come in. We have a proven track record of getting our clients to the first page and we can help you too. Being positioned on the first page of Google can massively increase your enquiries. 95% of people will never search on the second page, you’re either on page one or you’re invisible. From a branding perspective being at the top of search results points you out as the leading expert in your field. If you would like us to help you get there then we’ll initially need to do some analysis of your site, competition and current activity. 1 – Fill Out the form below so that we can run a report on your site, look at the competition and your market and understand your requirements. 2 – Case Study. We’ll send you a confidential case study of one of our SEO projects which we took from nowhere to ranking several of their main keywords in a highly competitive central London sector.